How to revive rescued gardenia plant? Store vendor failed to care for the gardenia plant in his store. Gardenia plant appears to have died. Can it be revived? Gardenia plants are very finicky. Check to see if the branches are still alive. Dead branches will break and snap off. Live branches will bend and you can scratch the bark to see if it is alive underneath. 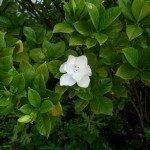 Here is an article that will cover the care needed for a healthy Gardenia.